The Blue Dog Coalition was formed in 1995 in reaction to devastating losses in President Clinton's first mid-term election. The moniker played off of the expression "Yellow Dog Democrats" of the South who were so loyal to the party after the Civil War. Blue Dogs could also refer to the idea that when dogs are not let in the house, they stay outside in the cold and turn blue. The Blue Dogs sought to find a compromise between conservative and liberal positions. They tended to be Democrats who were from rural districts who were pro-guns, pro-life and fiscal hawks. Blue Dogs were successful in 1996 and then Democrat National Committee Chairman Rahm Emmanuel used Blue Dogs to retake the House in 2006. However, in the same 2006 election cycle, progressive began to retake the Democrat Party. A Progressive candidate beat Senator Joe Lieberman (D-CN) in the Democrat primary, forcing the veteran lawmaker (who was quite an orthodox liberal except on staunch support for Israel and being a war hawk) to successfully run as an "Independent Democrat" in the general election. But this bode as a bad omen for Blue Dog Democrats. At their high water mark, Blue Dog Democrats had 44 members, which was roughly 20% of the Democrat Caucus. But progressive tides and internecine battles have lowered Blue Dogs ranks to 17 members which again puts them out in the cold. At the beginning of the 115th Congress, Representative Tim Ryan (D-OH 13th formerly 17th) sought to run for House Minority Leader against the incumbent Representative Nancy Pelosi (D-12th formerly 5th & 8th). The final vote was for unseating Pelosi not even close 134-63. Considering the way that close to 70 Democrats (all from safe Democrat districts) boycotted President Trump's inaugural festivities shows that Congressional Democrats seem dedicated to the progressive cause, under the delusion that they will retake the House in the 2018 elections. The Democrats continue to be obsessed with gun control, abortion rights, liberal immigration and an ever expanding government.Thus it seems that Democrats continue to count on winning urban voters along with educated white collar suburban voters in their path to victory. 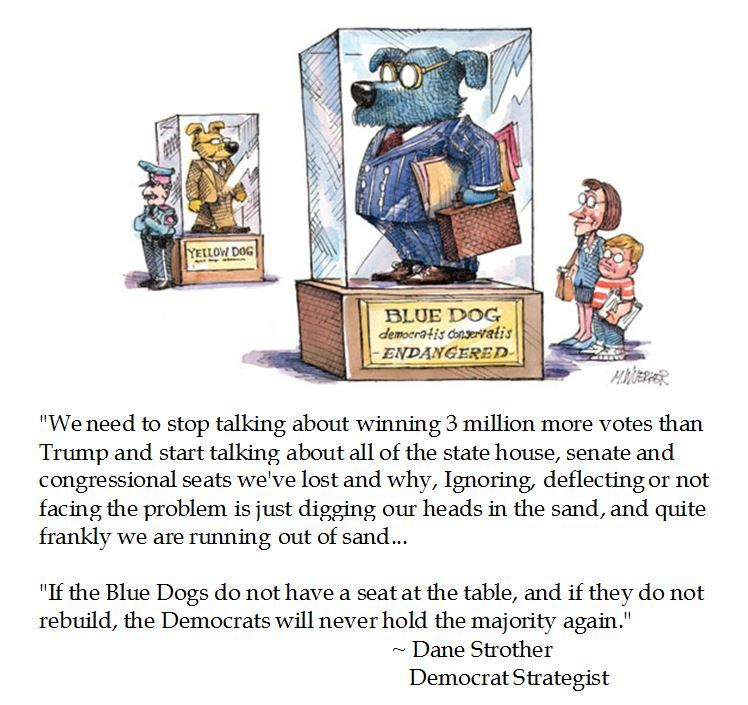 This sort strategy leaves Blue Dog in the cold, forcing them to accept irrelevance amongst the DC Democrat party or to go against their tradition and aversions to vote GOP to remain relevant. It was fascinating to see how 2016 Democrat Presidential nominee Hillary Clinton (D-NY) ran against coal country in her futile bid for the White House. Hillary lost the Keystone State by about 46,000 votes. That slim margin of victory may have been taken from President Trump's increased support in Central Pennsylvania, which epitomized Blue Dog Coalition voters. In Washington Examiner, Salina Zito noted how Cambria County, Pennsylvania, which contains the old industrial city of Johnstown, has shifted from being a 70 reliably Democrat area in 2006 to today being a 70% Republican area. It is these working class white voters that Democrat strategist Dane Strother worries that imposing a progressive purity test will drive Democrats into the political wilderness for forty years. President Trump may have sensed the alienation that Blue Dogs (who also comprised "Reagan Democrats" in the 1980s) felt, and now seeks to cement the relationship with them. Thus the overtures to labor leaders and winning back manufacturing jobs as well as fulfilling campaign promises which validate voters who then candidate Barack Obama derided as those who were "Bitter Clingers" to their bibles and their guns. Representative Lacy Clay (D-MO 1st) held a contest to display artwork on Capitol Hill. The winner was 18 year old Cardinal Ritter Prep High School Senior David Pulphus with "Unnamed #1". This piece has stirred controversy as the adolescent's artwork depicts cops as pigs brutalizing blacks. It should be noted that a prominently depicted agitator is also depicted with lupine features giving the "Black Power" salute. Pulphus's piece also inserts a black man in graduation garb being crucified by the scales of justice. Charitably this can be considered an allegory to the unrest unleashed in Ferguson, Missouri, the birth place of Black Lives Matter. But it seems more like an épater les bourgeois to defame cops as animals. 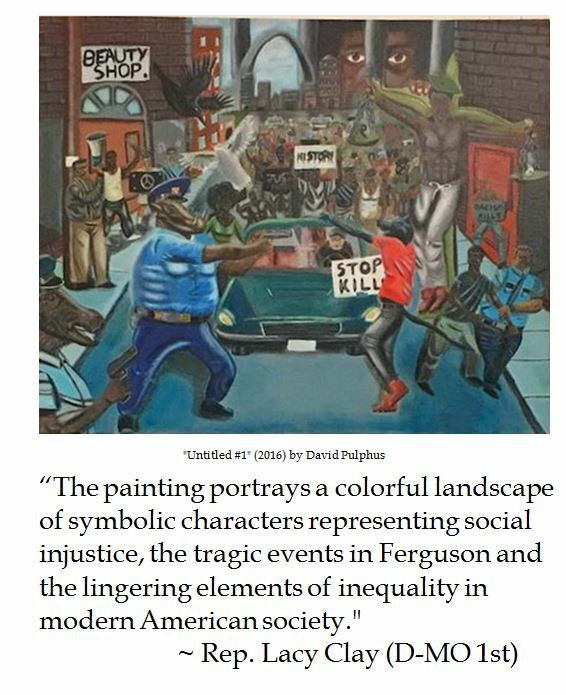 It is ironic that the one business featured in the painting is a beauty shop, which was one of the businesses that black owned businesses in Ferguson that BLM rioters burned. But Joe Patterson with spokesman for the St. Louis County Police Association noted: "[W]e are not about censorship, but good art and good taste are sometimes not the same thing.” Patterson characterized Pulphus's Untitled #1 as a "punch in the face" to law enforcement and commented: “This is an extraordinarily disrespectful piece at a minimum." There have been calls from Police Associations around the nation to take down the pig headed anti-cop artwork. The work had been exhibited since June 2016 in the tunnel that leads to the Longworth Building on Capitol Hill for several months before the controversy. Post Scriptus 01/06/2017 15:00 EST: Representative Duncan D. Hunter (R-CA 50th) took down "Untitled #1" on his own accord. Hunter invited his House colleague Clay to put it back up if he wanted. “The rehanging of this painting for public view represents more than just protecting the rights of a student artist, it is a proud statement in defense of the 1st Amendment to the U.S. Constitution which guarantees freedom of expression to every American." Update 01/17/2017 The Architect for the Capitol has determined that Pulphus' anti-cop art violates contest rules about depicting controversial political subjects and will be taken down for good by January 18, 2017. UPDATE 04/18/2017 DC Federal Court Judge John Bates denied issuing a preliminary injunction to restore display of the painting while the litigation continues. Rep. Rep. Clay and artist Pulphus plan on appealing the ruling. Should Anti-Cop agiprop artwork be exhibited on Capitol Hill? A legacy of former Senate Majority Leader Harry Reid (D-NV) was the effective elimination of the confirmation filibuster. Under the Constitution, it is the Senate's duty to confirm Executive and Judicial Branch appointments. Senate rules allowed for confirmations with mere majorities, but needed to obtain 60 votes to cut off debate (Cloture) and preclude a filibuster. The Cloture vote was intended to prevent endless obstructionism while still giving the minority some say in the proceedings of the Upper Chamber of Congress. Needing to get enough votes for cloture was an incentive for Republicans to select more moderate appointees which required Senate consent. But such Senate niceties stopped political steamrolling by Majorities who wished to exercise their unadulterated will. When the Obama Administration sought to pack the Court of Appeals for DC (aka the DC Circuit), which is the court of authority for regulatory bodies, it ran into trouble when its candidates might not have received the requisite support for a Cloture Vote. So then Senate Majority Leader Harry Reid, exercised "The Nuclear Option". Exercising the Nuclear Option had been hotly debated in the preceding decade, but then Senate Majority Leader Bill Frist (R-TN) opted not to circumvent tradition. 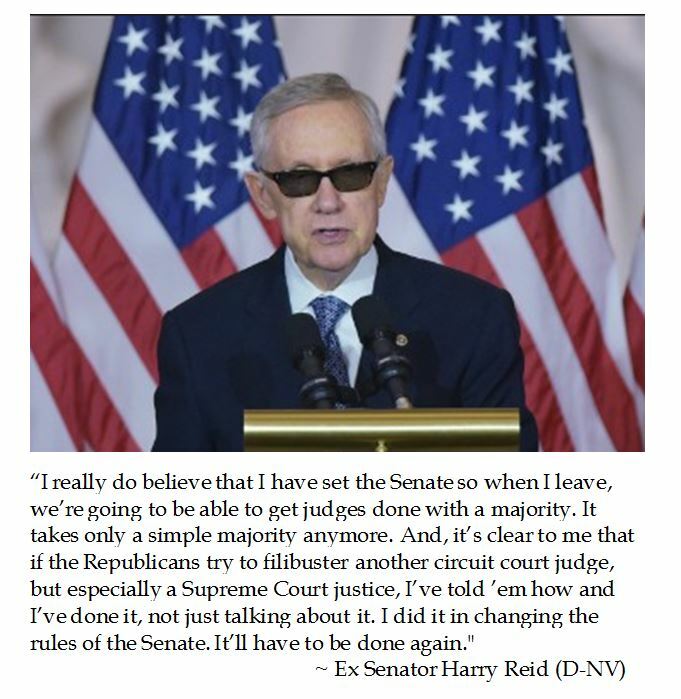 Through Parliamentary legerdemain, Reid established a precedent in which he said that all judicial nominees, save Justices of the Supreme Court, would be considered on majority votes and did not have to pass the Cloture Vote threshold. The Reid Rule was great when one's party is in control of the Senate and the White House. But in 2017, President Donald Trump will occupy the White House and Republicans have a two seat majority in the Senate. Incoming Senate Minority Leader Chuck Schumer thinks that he can stymie the Trump Administration through the advice and consent clause as well as any Supreme Court nominations which do not represent progressive Democrat values. However, Schumer may well rue the Reid rule legacy from Dirty Harry Reid. Senator Ted Cruz (R-TX) and Salem Radio host Hugh Hewitt had an informative colloquy on the Reid Rule. Republicans may not moderate their choices for positions which need to be confirmed by the Senate. Despite Harry Reid's contention that the "Reid Rule" excludes Supreme Court nominees, it is contented that avoiding Cloture for a Supreme Court nomination would simply be a second application of the Reid Rule precedent. In 2016, there were many controversies about cyber-censorship. Some social justice warriors will fret about the Great Firewall of China. But there are examples of being cyber censorship which are much closer to home. These are not instances of benign curation, such as Apple blocking Flash media links because the media might not display properly in the Cupertino created cyber walled garden that Apple owners expect. These are instances in which a cyber nanny decides what content should be seen. Facebook was called out for its biased curating of hot topics to favor liberal sensibilities. While it is hard to believe that well informed people consider Facebook their primary news source, The Guardian asserted that Facebook is arguably the most important distributor of news online. But a former Facebook editor revealed that many times conservative news topics did not trend on Facebook’s sidebar because the liberal leaning staff did not recognize news topics (like CPAC) or held an animus against conservatives (like Ted Cruz). In response to the conservative outcry, Facebook's CEO Mark Zuckerberg held a "Conservative Summit" at the company's Menlo Park, California headquarters with right leaning luminaries such as Dana Perino and Glenn Beck to discuss the matter. While some leading conservatives declined to participate in a so called Facebook photo-op, the social media service subsequently announced some sweeping changes meant to ameliorate the media mess. Although Facebook's internal report denied any ideological bias, they acknowledge limitations of their efforts. Facebook stopped relying on RSS feeds for curation. Instead it would use a select group of publications to discern if a story should be trending news. Another instance of Facebook acting like an overzealous Cyber Nanny is how pages of content creators are being capriciously unpublished. Close to ten years ago, Facebook established Fan Pages that are separate from a personal page, which attracted eyeballs for various interests and business (as well as generating ad income for Facebook). But recently a group of 2200 content creators banded together under the banner of #powertothepages to protest the byzantine process to objecting to content censorship by Facebook. To try to explain how Republican Donald Trump was elected President of the United States, many stunned progressives sought to blame "Fake News". Prior to the surprising Election 2016 results, President Obama opined that we need a curating function to deal with the wild west of information flow. 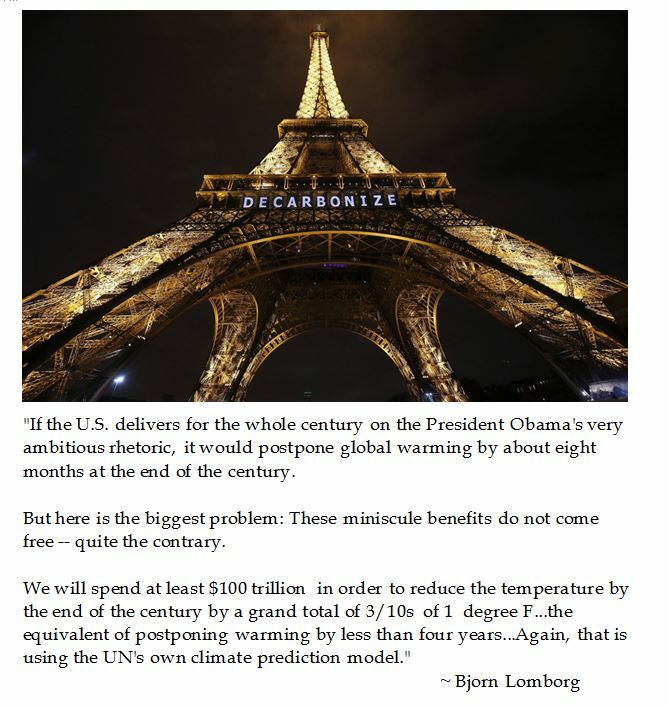 This may sound reasonable to hurried casual current event followers to have a source that dictates what is real news. But who decides and on what basis are better questions. Bloomberg View author Noah Feldman hopes that the news market can correct itself, but that the state might have to step in. Obviously, the journalist does not appreciate the import of the First Amendment: "Congress shall make no laws..abridging the freedom of speech, impeding the freedom of the press..."
Some social media companies seem to have taken matters into their own hands before the state imposes censorship. Twitter has unceremoniously shuttered some users who spout ideas that do not appeal to the powers that be, such as Milo Yiannopoulos. While Twitter claimed that @nero violated their Terms of Service with his unflattering exchanges with Ghostbusters' actress Leslie Jones, his rhetoric hardly seemed over the top, yet Twitter CEO permanently banned Milo from the social media site because the exchanges inspired hate mail towards the Hollywood luminary. 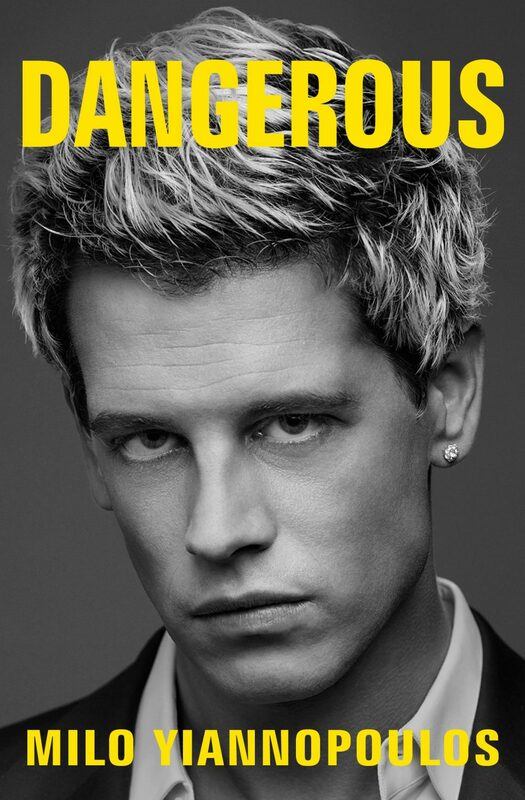 Although efforts to #FreeMilo failed to succeed with Twitter, Milo did not make out so bad as Yiannopoulos scored a $250,000 book deal for his memoirs on the social media ban. Others facing social media suspensions are not as handsomely rewarded. A social media site can lock an account on an unsuspecting user and the only established objection process is appealing to an automated digital Big Brother. If the Cyber Nannies look with favor upon the frantic plea, the user is urged to adhere to the TOS, without knowing exactly what was the infraction, It seems that many progressive activists are eager to claim abuse and a cautious social media company will cover their bases by proactively locking controversial accounts. Liberal Cyberbullies also ape invoke tactics gleaned from lawfare. In the run up to the election, a liberal lawyer objected to a political cartoon of Democrat Presidential nominee sporting an orange "pant suit" behind bars with a tag line "Perhaps Hillary Clinton looks best in an orange outfit." The self proclaimed attorney insisted that she would sue for libel as "destroying a person's reputation with lies and gossip are blatant libel." Of course, in a rational world, this off-kilter attorney had no standing to sue and even if that weren't the case, the standard for about prominent figures is an extremely high bar, particularly involving political speech in the run up to an election. Still, knowing the legal system, it was prudent to take time to document everything in case a nuisance lawsuit was filed. Rather that file suspected abuse charges against this budding cyber bully, it seemed better to give the liberal loon a wide berth. Another modus operandi by micro-blogging platforms is to shadow block as a means of cyber-censorship. Posts which contain hashtags or terms which offend the powers that be are effectively blacklisted by being published but kept from going into search features and is hidden from others' timelines. Twitter has confirmed that it shadow blocks. Twitter does not impose this stealth ban only against spammers but also targets the alt-right, politically incorrect or cultural libertarians. It again begs the question about curation on who decides and on what basis as to posts that are suppressed. Even micro-bloggers with sizable following have abandoned platforms imposing cyber censorship. James Woods, a Hollywood actor who had a following of 484,000 Twitter users, quit the social media site as he objected to the suppression of free speech as highlighted by the purge of prominent alt-right accounts. There has been some push back against cyber censorship. In August 2016, Andrew Torba created Gab.ai, a micro-blogging platform which allows for all points of view and champions the principle to #SpeakFreely. Even though Gab is still in beta, it has over 100,000 users and is a top 3,000 internet site, even as it is currently invitation only. Some have suggested to challenge censoring social media platforms by investigating and litigation the violations of the terms of service by the internet companies. Frankly, that seems like a fool's errand. These cyber bureaucrats can claim TOS violations and unless it is a high profile case like Milo Yiannopoulos or James Woods, they will not feel compelled to respond. While they should champion free speech, the First Amendment is a limitation on the government not a private corporation. Recently, it has become apparent that some content has been stealth banned too close to home.. Although it is praiseworthy to invoke the Ignatian principle of Presupposition by giving one's antagonist the benefit of the doubt. But using analytics and comparing similar web pages, it is dubious that the stealth banning is not content curation for its viewpoint, not because of obscenity, spamming or harassment (which would be clear TOS objections). It is disheartening to know that Facebook Content Creators can be deprived of their sources of income by vague complaints made by anonymous sources, and there is an impersonal automated system to object to these page pull downs. But it reinforces the wisdom of not depending only on one platform. It is important to find work arounds and not be at the whims of abstract internet overlords. Methodologies can be tweaked and new ways of getting the word out can be developed to speak freely. In this era of hyper polarization, there are going to be efforts to block viewpoints which challenge progressive proclivities. To often, the silent majority has let things go in order to tend to their own personal interests. Between technological advances and the entrenchment of liberals within the apparatus of government, the levers of culture and "our betters" in academia and corporate boards, free speech for conservative and traditional values could be crushed. This will not stand in the District of Calamity (sic).